There is no better feeling than buying something hand-made. You can almost feel the amount of work the maker put into each stitch. This is what makes all the products at AJ Leather one-of-a-kind: each item is made from 100% genuine leather or 100% cotton and all hand-embroidered. Since 1992, this wholesale supplier has been bringing unique products to retailers all over. 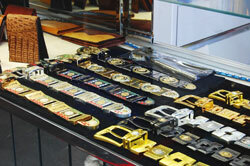 AJ Leather mostly sells leather garments, belt buckles, quality wallets, hats, and more. Within the past year, Amarjeet Kalra, the owner of AJ Leather, decided to add hand-embroidered Mexican dresses, blouses, and bags to his inventory. “I saw a friend looking for hand-embroidered products, so I decided to start selling them, too,” he said. These products are made from 100% cotton and seem to be a very popular seller right now, according to Kalra. These colorful dresses come in all black with flower stitching over the chest, waist, and bottom. Their blouses also come with the colorful flower stitching and make for a perfect lunch date or a night out with friends. You can make a perfect matching display with their handmade flower-embroidered bags and 100% leather colorful shoes. Since all of these items are handmade, no product is the same, so customers will really feel like they are buying unique pieces! In 2004, AJ Leather moved to Dallas, TX from Las Angeles, CA to make it more convenient for their customers. Dallas is a more central location and shipping is easier, making them able to ship out orders the same day of purchase and then customers will receive that shipment in 3 business days. The company is still growing and has more plans for the future, but they are still known for their handmade genuine leather items. Some other products AJ Leather sells are cowhide wallets, concho wallets, leather purses, belts, jackets, belt buckles, hats, key chains, and more. They provide the best quality leathers in the nation and import top leathers from Mexico, China, India, and Japan. All of their products are handmade in Mexico and are sold at a wholesale price you just can’t pass up. For more information about their products, visit www.ajleatherinc.com.